Def Leppard played show 43 of their Summer Tour 2014 last night in Mexico City, MEXICO and here are the setlist statistics. 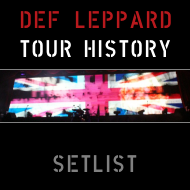 The show took place at Palacio De Los Deportes with 17 full songs played by Lep. View all the stats below after 43 shows. The next show takes place on 6th September in Monterrey. 15 of these songs were played at the last Mexico City show in September 2012. 'Action' and 'Promises' were last played here at the Auditorio Nacional in 17th November 2005 during the Rock Of Ages tour. 17 songs played from five studio albums/one compilation album.